CV’s for Nannies, made easy…. 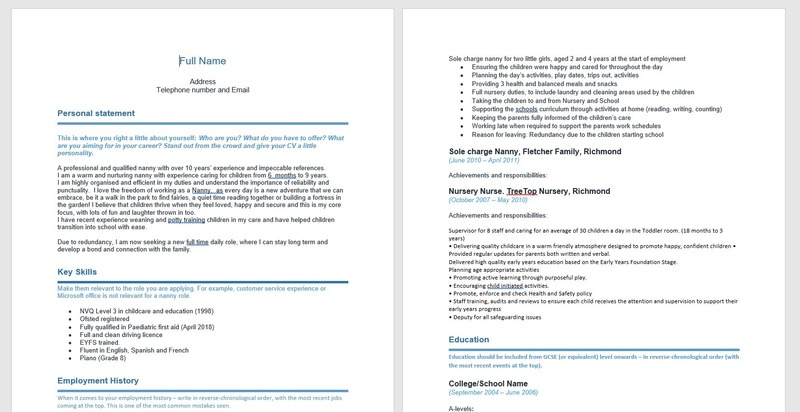 Our handy Nanny CV template. Nobody likes writing a CV…. Absolute childcare reject an average of 150 CV’s per Job post daily – so its REALLY important that your CV looks great and stands out. This is where you right a little about yourself: Who are you? What do you have to offer? What are you aiming for in your career? Stand out from the crowd and give your CV a little personality. A professional and qualified nanny with over 10 years’ experience and impeccable references. I am a warm and nurturing nanny with experience caring for children from 6 months to 9 years. I am highly organised and efficient in my duties and understand the importance of reliability and punctuality. I love the freedom of working as a Nanny, as every day is a new adventure that we can embrace, be it a walk in the park to find fairies, a quiet time reading together or building a fortress in the garden! I believe that children thrive when they feel loved, happy and secure and this is my core focus, with lots of fun and laughter thrown in too. I have recent experience weaning and potty training children in my care and have helped children transition into school with ease. Due to redundancy, I am now seeking a new full time daily role, where I can stay long term and develop a bond and connection with the family. Make them relevant to the role you are applying. For example, customer service experience or Microsoft office is not relevant for a nanny role. When it comes to your employment history – write in reverse-chronological order, with the most recent jobs coming at the top. This is one of the most common mistakes seen. Sole charge Nanny, J Blogs family, Twickenham. • Delivering quality childcare in a warm friendly atmosphere designed to promote happy, confident children • Provided regular updates for parents both written and verbal. Delivered high quality early years education based on the Early Years Foundation Stage. • Promoting active learning through purposeful play. • Encouraging child initiated activities. Education should be included from GCSE (or equivalent) level onwards – in reverse-chronological order (with the most recent events at the top). Although this section can help to get your personality across, it’s not an essential part of your CV. So if you don’t have any, don’t feel like you have to include them – especially if overused clichés like ‘socialising with friends’ and ‘watching films’ are all you can think of. Instead, only include hobbies are that are particularly unique (that you can expand on at an interview), prove your skills, and/or back up your motives for applying for the role. If in doubt; ask yourself: will they help you get the job? If not, it’s best to leave them out. I am a keen cyclist and enjoy getting out in all weathers. I recently cycled Brighton to London and raised £5,600 for Great Ormond Street. I love to cook and enjoy experimenting with new recipes. I am also a volunteer at my local riding school most weekends, assisting children with disabilities to ride. Stating that references are available on request is fine. However, always make sure you do have credible references and ask permission before giving out details. How to find (and keep) an after-school nanny.